What’s more enjoyable than a city break to discover traditional and magical Christmas markets, hand in hand with your beloved or with your family? There are scents of cinnamon, mulled wine and gingerbread in the air and light snowflakes falling down from the sky. Some European destinations have decided to offer you memories for a lifetime; come admire the most beautiful Christmas lights in the evening: they sparkle a thousand lights. Discover your selection of the most beautiful Christmas lights in Europe and book your flights and your hotel at the best price for a magical stay in Europe. You have ranked Colmar in first place of the best Christmas lights in Europe. Indeed the city seems to have been created in the workshops of Santa Claus. The beautiful traditional half-timbered houses are colourful and look like gingerbread houses! Colmar is probably one of the most beautiful destinations in France and one of the most romantic ones for families, lovers and lonely travellers, for culture, wine tourism and nature lovers too. From the end of November to the end of December come enjoy Colmar’s Christmas lights. The show is unforgettable, that is why Colmar is THE must Christmas destination. The inhabitants are also parts of the project : they decorate their houses and make them look magic. Take a photo of your favourite house in Colmar and post it on social networks with the #ebdestinationsxmas. Stroll through Colmar and enjoy its sweet and warm atmosphere. When: 22nd November to 29th December 2019. Where to stay: We have selected for you hundreds of accommodations at the best prices in Colmar. 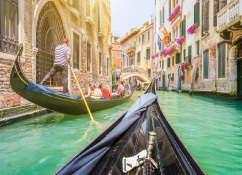 We loved staying at the hotel "Le Colombier", located in the district of the "Petite Venise" as well as in the "Hotel Turenne" freshly renovated with excellent value for money. The artistic illuminations in the streets of Salerno last from mid-November to the end of January. The city of Salerno is one of the most illuminated cities in Europe. Every year, new artistic creations are added to this magical show. You can also walk to the Salerno Christmas Market and take a Ferris wheel tour to get a breathtaking view of all the illuminations of the city of Salerno. Book your flights to Salerno as well as your hotel at the best price and treat yourself to a timeless moment in Salerno. When: 11th November 2019 - 21st January 2020. Where to stay: Hotel Montestella, 400 m from the train station and only 9 minutes walk from the beach. The Street of Light is stunning. It is inaugurated on the first day of the opening of Edinburgh's Light Night (from mid-November to the end of December). Tens of thousands of small lamps light up in rhythm with the music. 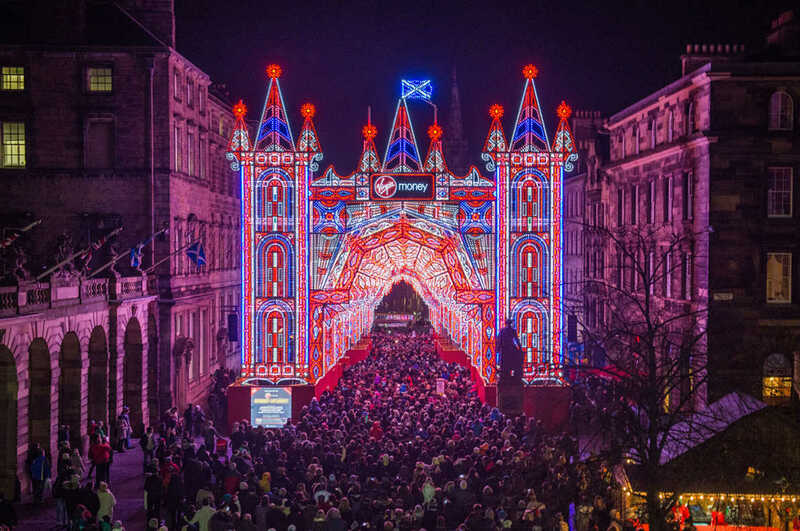 There are outstanding light installations throughout the city during Edinburgh Christmas Light Night. Do not waste time and book your flights to Edinburgh as well as your hotel at the best price and your best things to do in Edinburgh such as a "Lochness, Highland & Whisky distillery tour from Edinburgh". When: 17th November 2019 - 5th January 2020. Where to stay: One of travellers' favourite hotels for its location and value is The Castle Nest, located 60 m from the Royal Mile in Edinburgh. 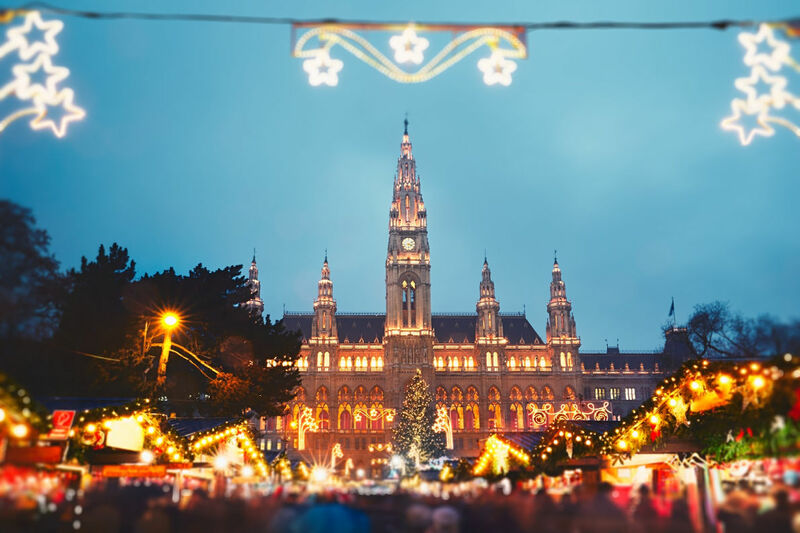 Vienna with its many Christmas markets, spread all over one of the most romantic cities in Europe, is the perfect destination for Christmas lovers. What we like in Vienna is the elegance of its Christmas decorations. If you’d rather see lots of Christmas fathers dancing in the streets and hearing singing colourful garlands, Vienna may not be the best destination for you. If you like chic, sobriety and elegance, book your flights to Vienna as well as your hotel at the best price and your best things to do in Vienna such as a ticket for Mozart & Strauss Concert in Kursalon Vienna. When: 16th November - 24th December 2019. Where to stay: Living Hotel Franz Joseph Kaiser, one of our top picks in Vienna. Each year Carnaby Street offers incredible illuminations, certainly the most original ones in Europe. The theme this year is Freddie Mercury & Bohemian Rhapsody. Carnaby Street is one of the nicest places to hang out or do shopping in London although all London is beautiful at Christmas. Carnaby Street offers a touch of originality & freshness. Book your flights to London as well as your hotel at the best price and your best things to do in London such as a "London by Night: 90-minute open top bus tour". When: 8 Nov 2019 - 5 January 2020. Where to stay: The Z Hotel Tottenham Court Road, located 200m from Carnaby Street. 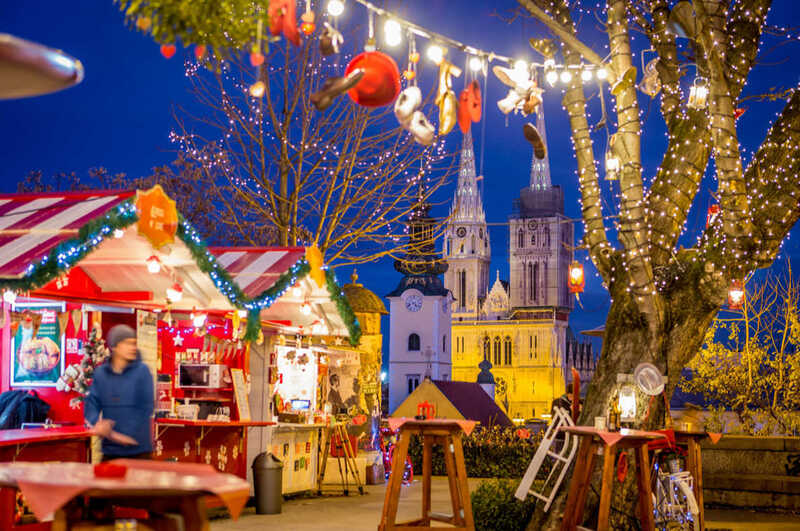 Budapest is becoming more and more successfull at Christmas and one of the unmissable destinations for Christmas market enthusiasts. There is no doubt about it : Budapest is a magical destination at any time of the year, but Christmas is definetely a special moment for the city. Christmas is everywhere! Enjoy the Christmas market with its stalls displaying mulled wine, gingerbread, hand knitted wool sweaters, traditional and original gifts. 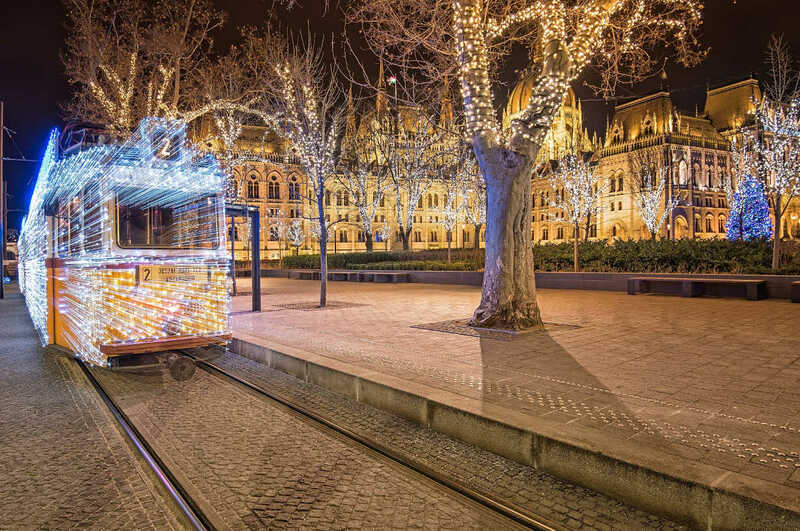 If you are a Christmas illuminations fan, do not miss the trams of Budapest decorated with Christmas garlands, and the Advent Feast Christmas tree at the Basilica; it is standing in the middle of an ice rink. Budapest is just a dream place to spend Christmas with family or lovers. Book your flights to Budapest as well as your hotel at the best price and your best things to do in Budapest such as a "Budapest: 2-hour Danube cruise with live music". When: From 23rd November 2019 to 1st January 2020. Where to stay: For budget travellers, the City-Hotel Budapest is perfect, just a few steps from the Basilica and the Christmas market. For a 4 star stay, the Parlament Hotel is perfect. 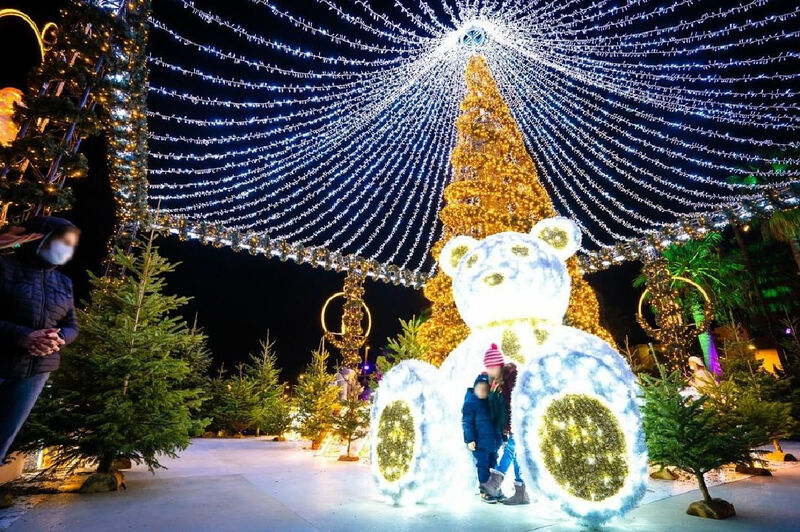 Salajland is a Christmas Theme Park located in Grabovnica, an hour's drive from Zagreb. Treat yourself to a day trip to Salajland, a private amusement park run by the Salaj family, It is unique in the world ! 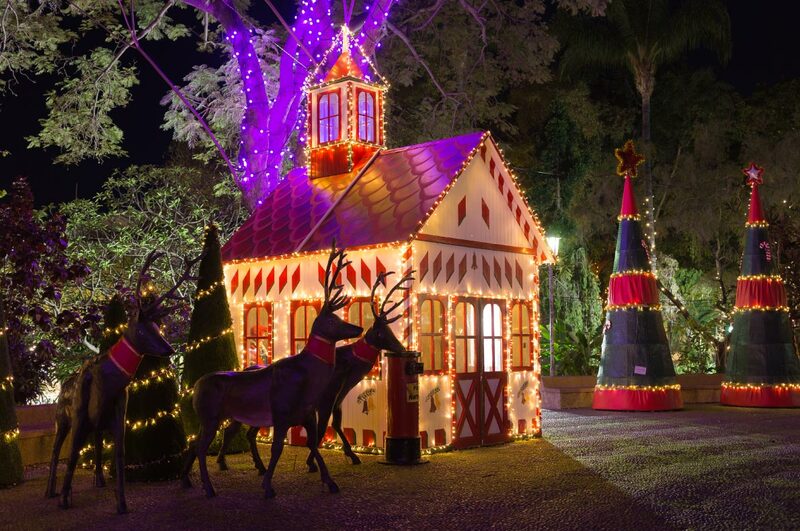 Every year this family decorates with care the 15 hectares of its huge garden to offer hundreds of thousands of travellers an exceptional show. 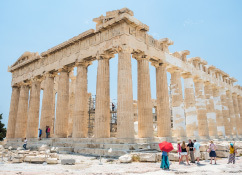 The entrance fee is 4 euros, a small contribution to the huge investment of this incredible family that rivals the major European capitals to offer travellers a magical moment. Why do so many travellers choose Zagreb to celebrate the end of the year? Because the Croatian capital has been awarded three times the title of "European Best Christmas Destination". Book your flights to Zagreb as well as your accommodation and your best things to do in Zagreb and treat yourself to a magical Christmas in Croatia. When: 1st December 2019 - 14th January 2020. Where to stay: "Hotel 9" located just across the main bus station. Malaga is one of the most trendy destinations for all travellers in Europe. Did you know that Malaga has the largest number of museums per square kilometre in Europe? At Christmas, the palm trees of the city are covered with Christmas garlands. You can enjoy many street concerts and buy original Christmas gifts in the shopping streets or in the different Christmas markets of the city. It is one of the most innovative destinations for Christmas illuminations. 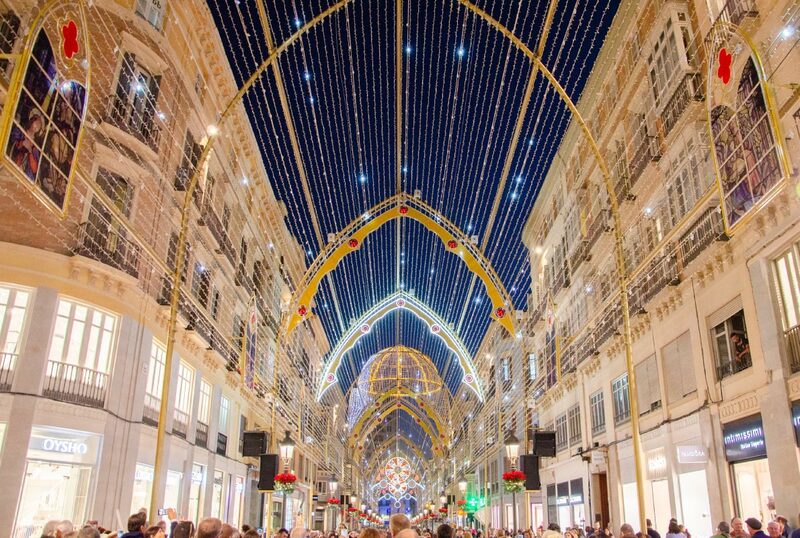 Each year Malaga offers an exceptional show to visitors from around the world who come to discover one of the most beautiful destinations to visit at Christmas. Book your flights to Malaga as well as your hotel and your best things to do in Malaga such as a relaxing massage in a traditional Hammam. When: 5th December 2019 - 6th January 2020. Located in Franche-Comté (Eastern France), the town of Montbéliard – famous for its hospitality- turns into a pure enchantment a few weeks before Christmas. This year ’s special guest of honour ? Andalusia. 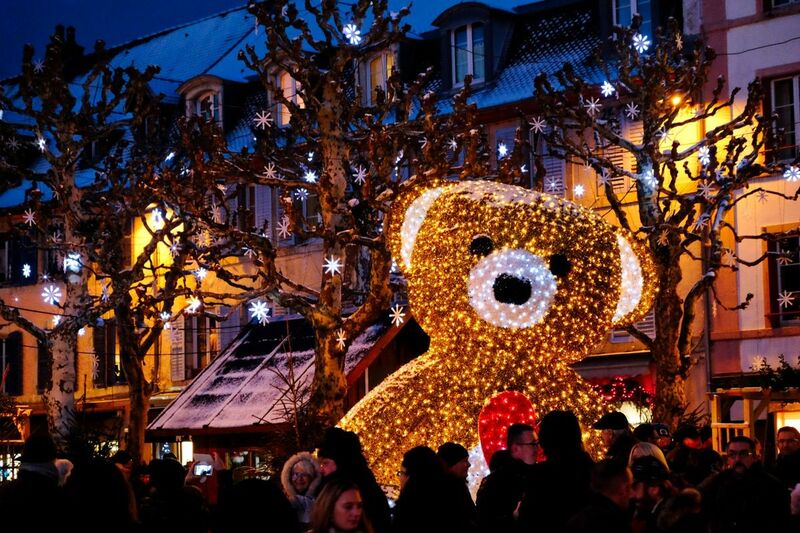 The event is more than a traditional Christmas market and Montbéliard wants to make sure the Christmas Lights offer the 500,000 visitors all their wonders . When: 23rd November – 24th December 2019. Where to stay: Hotel de la Balance in a 16th century building in the centre of Montbéliard. 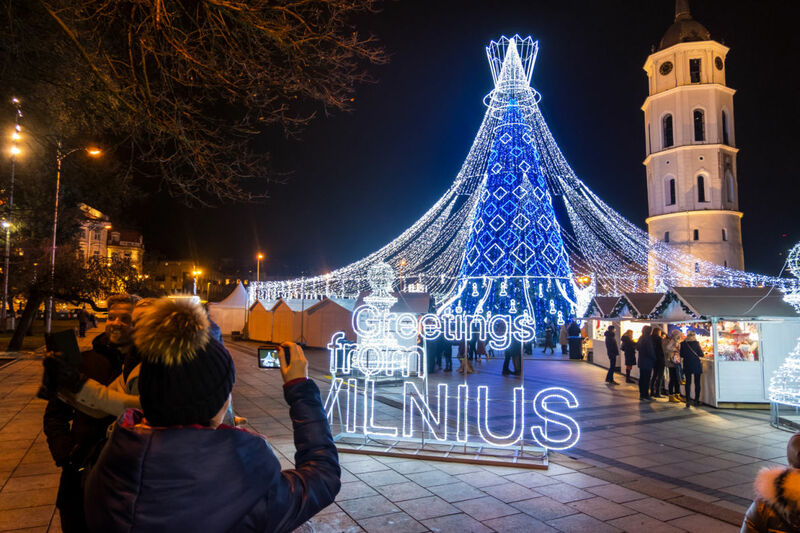 Vilnius has become one of the must-see destinations for travellers looking for the most beautiful Christmas markets in Europe. 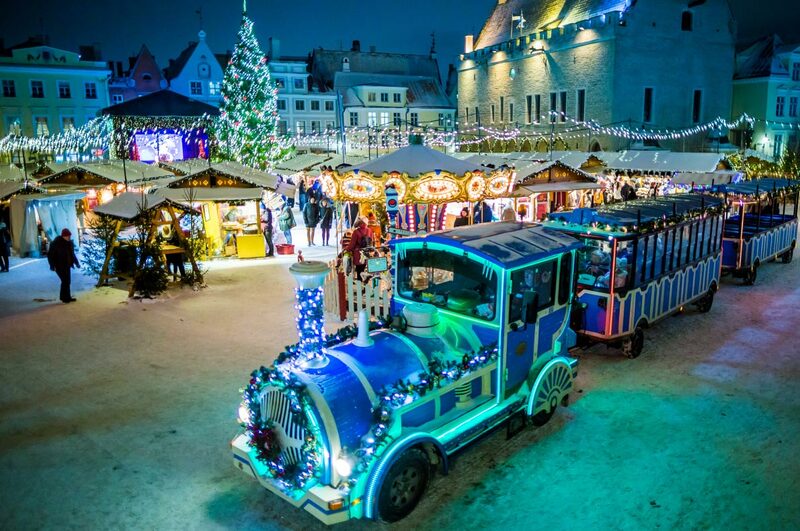 You can stroll on board the little Christmas train, buy original Christmas gifts, or taste gingerbreads, honey cakes, local cheeses or tasty pastries in the Christmas cottages that surround the magnificent Christmas tree from Vilnius, ranked among the most beautiful Christmas trees in Europe! Book your flights to Vilnius as well as your hotel at the best price and best things to do in Vilnius such as a private tour of Vilnius with a local guide. When: 1st December -2019 - 7th January 2020. Zagreb has been voted for several years in a row as the best destination for Christmas in Europe. 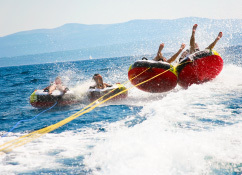 In a friendly family atmosphere, travellers from all over the world discover Croatian traditions, crafts, local products. Zagreb is a traditional city with its architecture, its monuments but is also very modern, young, dynamic, alive. 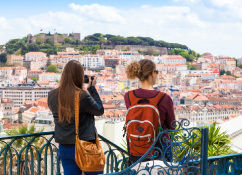 It is one of the most trendy destinations in Europe. 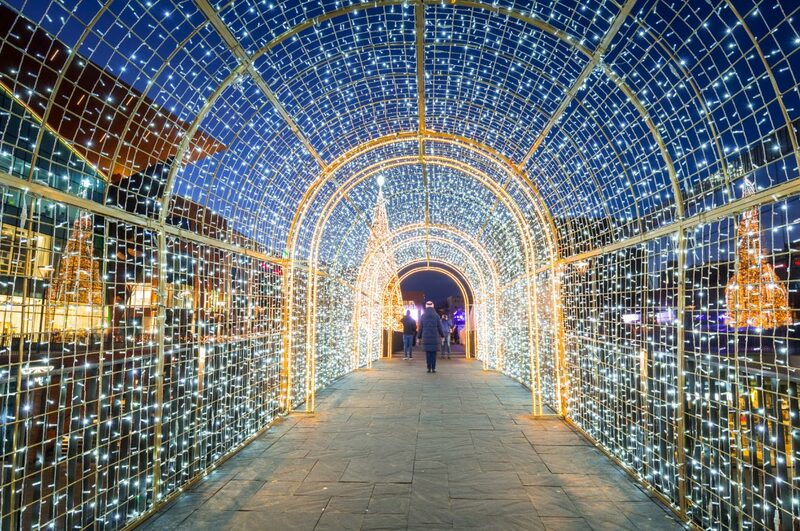 Come discover the Zagreb illuminations by booking your flights and your hotel at the best price as well as your best things to do in Zagreb such as a 2.5 hour walking tour with funicular ride. When: 30th November 2019 - 7th January 2020. Where to stay: "Hotel Dubrovnik" located in the heart of the city. We also love the 'Esplanade Zagreb Hotel', perfect for a 5-star stay. Enjoy the magic of Christmas under the palm trees in Nice, one of the most beautiful cities of the French Riviera. The temperatures are mild and not having the tip of your nose and fingers frozen at Christmas time can be nice sometimes. The colourful city does not do things half when it comes to celebrating an important moment. 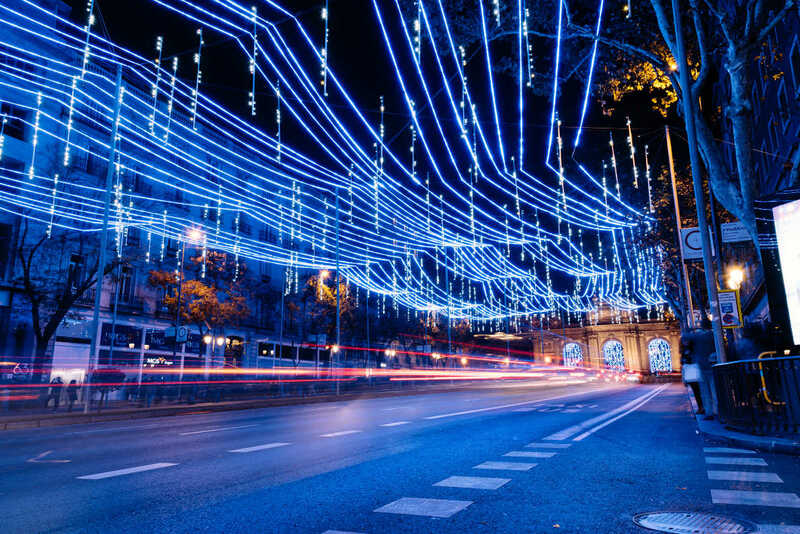 Every year the city of Nice decorates its streets with sublime luminous installations, refined or gigantic ones. 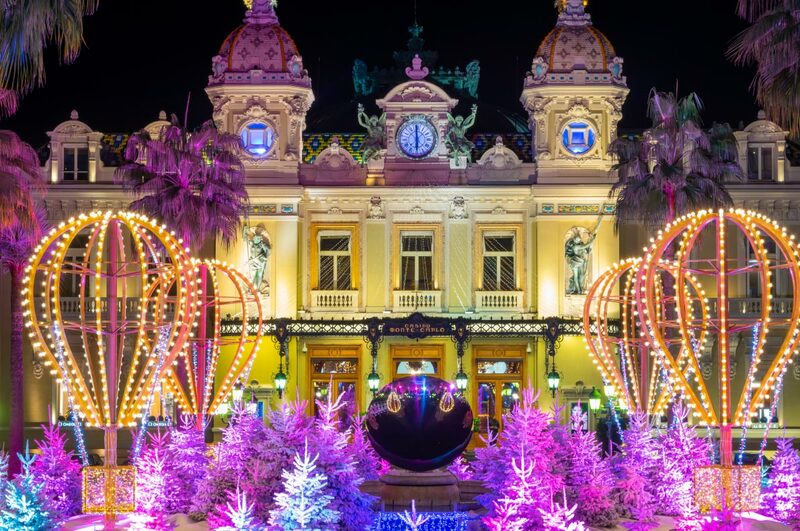 Discover the Nice Christmas market and its beautiful illuminations by booking your flights to Nice, your hotel at the best price guaranteed and your best things to do in Nice. When: 1st - 31st December 2019. Where to stay: Hotel du Centre for its excellent value & Hotel La Villa Nice Victor Hugo, elegant and perfectly located in the historic centre of Nice. Each year Madrid offers not one but 4 big Christmas markets. You are spoiled for choice and can discover the Mercado de Diiseno, the Feria Dulces de Navidad, the Mercadillo del Gato or our favourite, the Plaza Mayor Christmas Market. This Christmas market starts on the last week of November and ends at the end of December. It is certainly the most beautiful Christmas market in Spain. If you want to enjoy the Christmas market under the sun, 2pm is the right time. Treat yourself to a sunny getaway and discover one of the most beautiful Christmas markets in Europe. Book your flights to Madrid as well as your hotel at the best price and your best things to do in Madrid such as a "Live Flamenco show". When: 23rd November - 23rd December 2019. Where to stay: "Eurostars Madrid Gran Via" located 50 m from Madrid's lively Gran via. Let us derogate from our rule and invite you to admire the illuminations of Christmas Zoo Antwerp. To be honest, you won’t see giant Santa Claus lights or giant lollipops but what you will see is really worth it! Important characters from Chinese culture are the theme of these unique illuminations in the world with a great attention to details and incredible colours. The entrance fee varies from 10 to 15 euros. We advise you to book your visit in advance: this event is very successful. It takes place from mid-November to the end of January. You can also leave the zoo and visit the Christmas market of Antwerp with its 90 stalls. When: 30 November 2019 - 13 January 2020. Where to stay: Hampton by Hilton Antwerp Central Station situated 200 m from the Antwerp Zoo. Prague is one of the most romantic destinations in Europe. If you liked Paris you will love Prague; the city is made for lovers from all over the world. 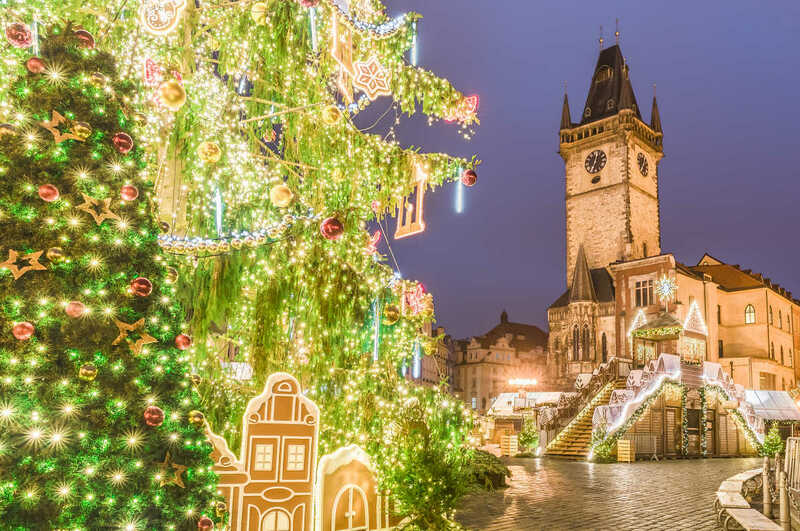 The Prague Christmas Market is one of the most beautiful Christmas markets in Europe. The unique atmosphere of the medieval central Prague makes the Christmas Markets at the Old Town Square very popular. In contrast to some bigger markets in Europe, the Prague Christmas Market is familiar, which makes the experience more intensive. The variety of food and beverages sold at the market is very generous. Visitors can look forward to traditional Czech food as barbecued pork, blood sausages, Czech muffins, conkers, beer, mull, mead and other typical gastronomic specialties from Old Czech cuisine. Book your flights and hotel at the best price and experience a magical Christmas in Prague. When: 1st December 2019 - 6th January 2020. Where to stay: "Smetana Hotel" situated in the heart of Prague. The hotel used to be the usual home of Mozart. If you are looking for the most beautiful Christmas lights, look no further, travel to Reims. Enjoy a breathtaking show around the Cathedral. The Cathedral of Reims is brought to light every year. It is a real bright gift that makes the historic heart of Reims beat. Reims at Christmas are not only illuminations but also a magnificent Christmas market with more than 140 traditional chalets. Reims is the capital of Champagne, so forget about mulled wine and let yourself be tempted by a glass of champagne for a sparkling Christmas. Book your flights to Reims as well as your accommodation at the best price. When: 21st November - 28th December 2019. Where to stay: "Holiday Inn Reims Center" ideally located in the historic centre of Reims.